One set of my 3rd great-grandparents are the John and Ann (Marshman) Richman family residing in Hilperton parish, Wiltshire, in England. The picture below is of John Richman, taken in the 1850's or 1860's. John Richman was born about 1788 in Hilperton, Wiltshire, ENGLAND, and died 25 April 1867 in Hilperton, Wiltshire, ENGLAND, (burial). He married Ann Marshman 08 February 1811 in Hilperton, Wiltshire, ENGLAND (parish). She was born before 1784, probably in Devizes, Wiltshire, ENGLAND (baptism), and died about 1856 in Hilperton, Wiltshire, ENGLAND. The parentage of John Richman is unknown. From census records, his approximate birth date is between 1788 (age 52 in 1841 census, age 79 in 1867 on burial record) and 1792 (age 59 in 1851 census). There are no baptisms of a John Richman found in the Hilperton church records in the period 1779 to 1795. However, the church records are fairly sparse during this time (Hilperton, Wiltshire Church Records, Bishop's Transcripts, 1748-1812, FHL Microfilm 1,279,404, Item 13). Searches were also made for Trowbridge and several other nearby parishes during this time period without finding a John Richman born between 1788 and 1792. If English naming practice traditions were followed, then the parents of John Richman were John and Elizabeth Richman. However, one can't be sure that the practices were followed. The first record of John Richman is at his marriage by banns to Ann Marshman on 8 February 1811 in Hilperton, in the presence of Thomas Marshman (Hilperton, Wiltshire Church Records, Bishop's Transcripts, 1748-1812, FHL Microfilm 1,279,404, Item 13). The baptisms of the children of John and Ann (Marshman) Richman are in the Hilperton church records during 1814 to 1825, with John Richman listed as a weaver and/or a laborer (Hilperton, Wiltshire Church Records, Bishop's Transcripts, 1622-1880, FHL Microfilm 1,279,404, Item 14). In the 1841 Census for Wiltshire, the John Richman family resided on Marsh Lane in Hilperton Marsh. The household included John Richman Senior (age 52, coal hauler), Ann Richman (age 59, weaver), Elizabeth Richman (age 30, weaver), James Richman (age 20, Ag Lab), with a second family in the same dwelling -- John Richman Junior (age 25, Ag Lab), Mariah Richman (age 25, weaver), Elizabeth Richman (age 5), James Richman (age 3) and David Richman (age 9 months). In the 1851 Census for Wiltshire, the John Richman family resided in Hilperton Marsh, Wiltshire, England. The household included John Richman (husband, age 59, butcher, born Hilperton, Wiltshire), Ann Richman (wife, age 67, born Devizes), Elizabeth Richman (daughter, age 38, weaver, born Hilperton), Mary Richman (granddaughter age 8, born Hilperton), and Rosa Richman (granddaughter, age 3, scholar, born Bath, Somerset) (1851 Census for Wiltshire District 257, taken 31 March 1851, FHL Microfilm 0,220,987, page 267A). In the 1861 Census for Wiltshire, John Richman (widower, pauper) resided in Hilperton Marsh with his granddaughter. A copy of a picture purported to be John Richman was provided by Russell Richmond of Putnam CT and also Barbara Richmond of Washington state, which had been provided by Roma Challis of Hilperton. The picture shows a seated older male. 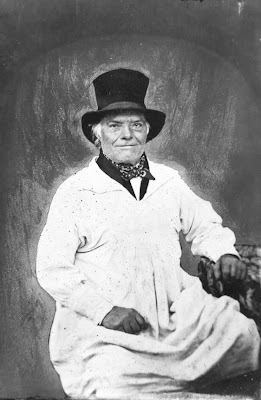 Roma Challis showed the Ambrotype picture (common in the 1850's and 1860's) to the Wiltshire Family History Society several years ago, and one of the members, who was an expert in period clothing, said: "He is wearing a traditional Wiltshire smock, his neckerchief would most likely have been red and his hat was fashionable about 50 years before the picture was done, so he probably had it for years, but kept it for Sunday best. I think you will find he was a farmer as well as a butcher. The smock he is wearing was made in Keevil, a village about four miles from Hilperton." John Richman died 26 April 1867 in Bradford-on-Avon in Wiltshire, and was buried in Hilperton, listed as "age 79." The parentage of Ann Marshman as Richard and Rebecca (Phipps) Marshman is conjectural. From census records, Ann was born between 1781 (age 59 in 1841 census) and 1784 (age 67 in 1851 census). An Ann Marshman, daughter of Richard and Rebecca (Phipps) Marshman, was baptized at Southbroom Church in Devizes on 20 June 1784. Another Ann Marshman was baptized 30 October 1780 there, daughter of Thomas and Ann (____) Marshman. Of course, there may be another Ann Marshman not in any church parish records. If traditional English naming practices were followed by John and Ann (Marshman) Richman, then her parents were James and Sarah Marshman (second son named James, second daughter named Sarah). However, one cannot be sure that the traditional practices were followed. In fact, it is very likely that they were not in this family. On the other hand, they named their third son Thomas and third daughter Ann, and did not name any child Richard or Rebecca. Another clue may be that a Thomas Marshman was a witness to Ann's wedding to John Richman in Hilperton in 1811. This might be Ann's father, brother, uncle or cousin. i. Elizabeth Richman, born 1812 in Hilperton, Wiltshire, ENGLAND. She married Thomas Hogan. ii. Sarah Richman, born 03 April 1814 in Hilperton, Wiltshire, ENGLAND (baptism). She married James Thompson. iii. John Richman, born 13 February 1816 in Hilperton, Wiltshire, ENGLAND (baptism); died 01 June 1884 in Bradford-on-Avon, Wiltshire, ENGLAND. He married Maria Mathews 11 October 1835 in Hilperton, Wiltshire, ENGLAND (parish); born About 1816 in Hilperton Marsh, Wiltshire, ENGLAND. iv. Ann Richman, born 08 March 1818 in Hilperton, Wiltshire, ENGLAND (baptism). She married John Hall. v. James Richman/Richmond, born Bef. 08 April 1821 in Hilperton, Wiltshire, ENGLAND, (baptism); died 20 December 1912 in Putnam, Windham County, CT, (vc). He married Hannah Rich 07 September 1845 in Hilperton, Wiltshire, ENGLAND, (parish); born 14 April 1824 in Hilperton, Wiltshire, ENGLAND; died 07 August 1911 in Putnam, Windham County, CT, (vc). vi. Thomas Richman, born 22 June 1821 in Hilperton, Wiltshire, ENGLAND (baptism); died 11 September 1844 in Hilperton, Wiltshire, ENGLAND (burial). vii. Mary Richman, born 22 June 1823 in Hilperton, Wiltshire, ENGLAND (baptism); died Bef. 1825 in Hilperton, Wiltshire, ENGLAND. viii. Mary Richman, born 23 March 1825 in Hilperton, Wiltshire, ENGLAND (baptism); died 22 May 1825 in Hilperton, Wiltshire, ENGLAND (burial). My descent from John and Ann (Marshman) Richman is through their son James Richman, who married Hannah Rich, and emigrated to the United States in 1855. My search for this Richman family is described in my post "Chasing my Richmans in England." RANDY, I thoroughly enjoyed this picture when I saw it earlier. Thanks for a second look. The description of clothing and colors worn makes this historic photograph take on the feel of an oil painting in my mind's eye. What happened on this day, or in that year?